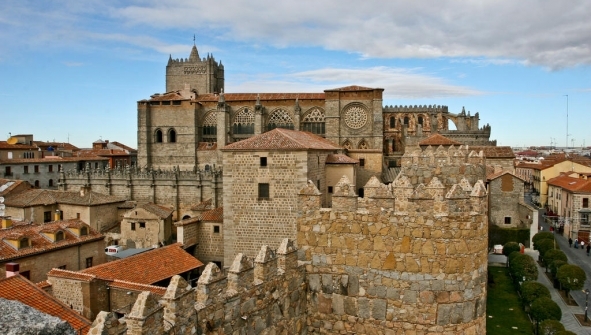 Cathedral, the Basilica of San Vicente, the Palace of the Eagles and the convent of Santa Teresa. In its dishes include roast pig and lamb, veal chops, beans from El Barco de Avila and Santa Teresa archiconocidas yolks, egg-based created and sugar. Avila shows us wonderful places like the Sierra de Gredos, where we have different options of boutique hotels, which will allow you to enjoy the scenery of this area without leaving the room. The Sierra de Gredos Regional Park is composed of a succession of gorges, cliffs, circuses and lagoons, highlighting the Laguna Grande de Gredos. Its geography allows to develop a variety of adventure sports from canoeing to hiking and canyoning, rafting and climbing. Children can also enjoy this environment through multi-adventure activities adapted or a visit to the museum of bees, allowing them to safely discover how they relate and act these insects. For the most relaxing getaways you can take a dip in the natural pools of Las Chorreras de Gredos Navarredonda. Cities worth visiting in the area are Candelada, Arenas de San Pedro and San Esteban del Valle, the starting point of the route of Las Cinco Villas. The province also has important archaeological remains such as the Castro of Cogotas, the Bulls of Stewing and the Roman road of Puerto del Pico.